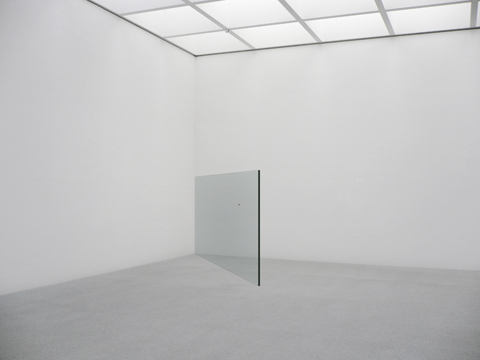 The sculpture SelfPortrait/Partition consists of a plate of bulletproof glass measuring 186 cm x 400 cm x 15 mm, where at the height of 137 cm a projectile Caliber .45 is cast in the glass. The plate should be positioned at the diagonally opposite corner to the entrance of the room of its display, in a way that seen from the entrance the plate seems almost invisible. Perceivable only as a fine line in the distant corner, the actual dimensions of the plate are revealed only by entering and moving in the room.